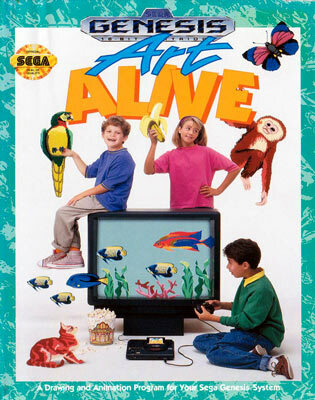 Art Alive allows you to draw, animate, and create on your Sega Genesis using all the standard tools you’d expect to find in a simple paint program, including pencil, eraser, line, fill, and spray. Several palettes of sixteen colors each are available to create your artistic masterpiece, and easy to understand icons allow even young children to participate. Adding to the fun are over 50 pre-drawn graphics and backgrounds for you to use in your artwork, including some with Sonic the Hedgehog and Toejam & Earl. Once you’ve mastered the art of drawing, you can make your image come alive with the animation tool. Create animations with up to four frames of your choice and control motion on the virtual canvas. You can even save your work by connecting your Genesis to a VCR. So, even if you’ve never drawn before, Art Alive makes it simple to create your own personal works of art.